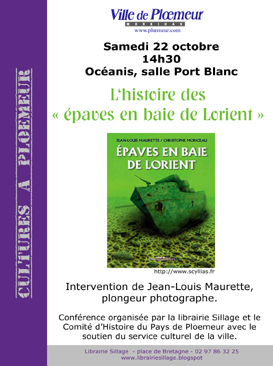 On Saturday, October 22nd, 2011, the Sillage bookshop, the Committee of History of Ploemeur and the Ploemeur cultural department organized, within the framework of the publication of l'Expédition Scyllias last work, Epaves en baie de Lorient, a conference on the story of these local sea-perils led by Jean-Louis Maurette and Jean-Yves Le Lan. 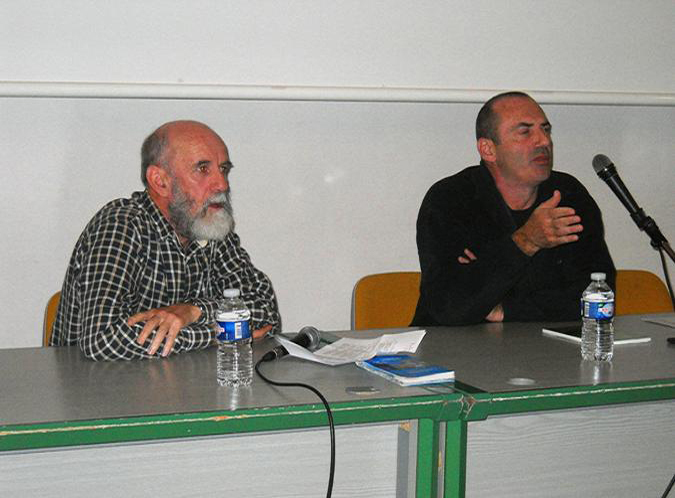 Debate and projection took place to the cultural center Océanis, admission was free. The conference started by the full projection of the documentary stemming from the DVD which accompanies each book. So gave this movie the possibility, for about fifty spectators, to virtually dive into the action and to discover, in a dynamic way, the most interesting part of the immersed heritage of Lorient area. Then came a biosketch of the association with its purposes, its action, its projects, followed by an evocation of all the shipwrecks detailed in the book and by an interactive debate in which Plœmeur inhabitants actively participated, asking questions and telling anecdotes. This conference showed itself as a place of exchange allowing to share a passion with a conquered and interested public in this underestimated facet of the contemporary historical heritage. Latest news at Sillage bookshop website. 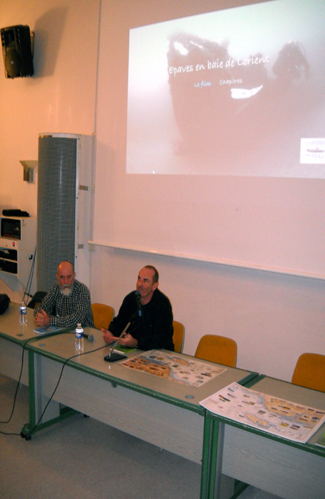 On the left : Jean-Yves Le Lan and Jean-Louis, in front of the mike. On the right : a center admirably endowed in technical means, charts, works and the DVD of the book, so many supports which allowed us to support the answers to the numerous questions aroused by the interest of a public quickly conquered.